We all know complainers. We can probably think of complaints we’ve made. I’ve written to companies on twitter myself to complain before, I’ve called the helplines, I’ve asked for managers. Verizon Wireless learned of my dissatisfaction about three weeks ago and, if I’m honest, I’m still not satisfied. We complain because something is wrong, something’s not going right, we’ve been offended or inconvenienced in some way. We complain because, usually, we want change but, feeling powerless, we simply complain. Sometimes, we even just complain because that’s what the conversation is about. And most of the time, it’s fair to say, our complaints come from a place of ungratefulness. And when we complain, we’re no different than the Israelites, the people of God. In our scripture this morning, we find them complaining. Here, late in the book of Numbers, the second generation of Israelites is wandering in the wilderness. Their fathers and mothers were rescued through Moses by God in spectacular fashion from slavery in Egypt. You remember the story from your childhood: the plagues, the booming voice of Moses saying “let my people go!” The dramatic escape across the Red Sea and the destruction of the god-king pharaoh’s army in the same. Here’s the essential thing to know. Immediately after their escape, the people begin to complain that they’re hungry and thirsty. God quickly comes to the rescue, sending manna which provides for their bodily needs. It falls at regular periods every day for six days, always enough to feed the people. Did you catch the complaint? At first, it sounds like they’re complaining that they’re hungry: there’s no food or water here in the desert. But, it’s easy to miss the real complaint. The real complaint is here, at the end of verse 5: “and we detest this miserable food.” They detest the manna, the literal gift from heaven, that God has made rain down on them, always providing for their needs. They are ungrateful, taking God’s provision for granted. They are no different from the five year old who, when given a plate of green beans to eat says, “I hate green beans.” And God’s reaction is no different than the mother or father who cooked them: indignation after providing, laboring, on behalf of the people to provide for their needs. But, around our dinner tables, when a child or, even, an adult complains that they don’t like the food they’ve been served, I’m doubtful that most of us would run outside, grab a rattlesnake, and threaten to kill our family and guests seated in our dining rooms. That would seem like overkill, literally. Except that’s what God does. The people complain and they get snake bit. And let’s not miss what’s going on here: this isn’t a metaphor: people are really being killed by poisonous snakes. And these are not your garden variety poisonous snakes, like a copperhead. No, the words “poisonous serpents” in the scripture can also mean “fiery seraphim” in the Hebrew. You may recall that seraphim are one of the kinds of heavenly hosts, often depicted as angels. But that depiction is wrong. Here’s what a seraphim is: it’s a venomous snake, with wings, that’s on fire. That’s what’s attacking the Israelites: flying poisonous snakes that are on fire. All because the people complained. Just as we wouldn’t bring a cobra to a dinner party to kill our family when they complain about our cooking, we think that this is overkill on God’s part. The people are just complaining. It’s wrong, it’s not great, but it’s not terrible, right? What is God up to? Does complaining warrant such punishment? Last April, United Airlines forcibly drug a man off a plane. The forcible removal, captured on video, quickly went viral on social media. Others joined the chorus of complaints, offering their own negative experiences with United as the video gained momentum. At first, United tried to deflect and defend the actions of their airline, but that only heightened the response online, deepening the complaints into outright anger. United’s stock tanked, their bookings dropped, and the company appeared, for a moment, to be in freefall. United’s experience demonstrates the power of complaining: like a snake’s venom, it’s infectious. A few people complain over dinner and the bite occurs. The venom spreads through the people at the dinner who then share the complaint with others. The complaint, like any infection, seeks a host and so it finds reasons to justify its existence. For example, after the video, the complaints moved from dismay and concern about this one incident to broader statements, like: The airline doesn’t care about its passengers. United is only in business for money. Those are much more damaging comments, the results of the infection caused by the complaint. The apostle James asks us to imagine how large a forest fire can occur from a single spark. So it is with the tongue, he says, noting the power of a harmful word spoken. And complaints are just such harmful words: like a snake’s venom, it infects the community and can threaten to destroy it. Complaints, like the snake’s bite, spread a venom around the community, around the organization, throughout the family, threatening it with nothing less than death. A complaining person is an infectious person, no different for the health of a church, a company, or a family than someone with the flu. 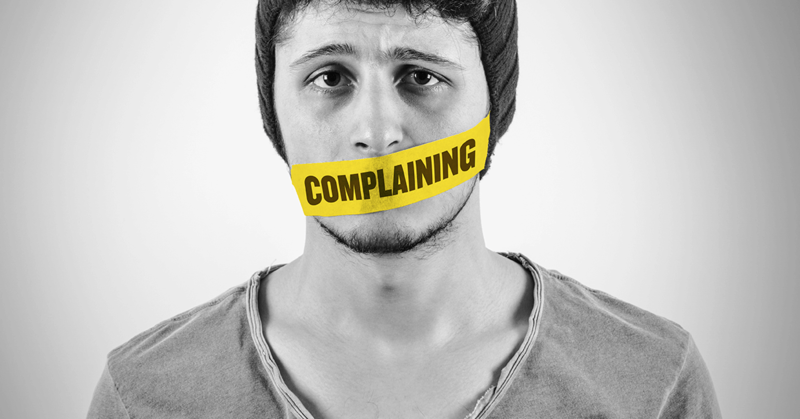 Except complaining is worse because, unlike the flu, complaining has a generational impact. Consider that this is the second generation in the wilderness, not the first. Where did they learn to be discontented with the food offered to them? Before their complaint, they say “Why have you brought us up out of Egypt…” Back in Egypt, their parents were slaves and cried out to God for deliverance. Back in Egypt, their parents were poorly fed, just enough to keep their strength up, and they cried out to God for salvation. Back in Egypt, their parents were desperate and they cried out to God to give them hope. Back in Egypt, life was terrible, and God delivered them. God saved them through plagues, through miraculous signs and wonders, through raising up leaders in Aaron and Moses, and, most dramatically, by bringing them safely across the Red Sea. The previous generation saw signs and wonders like we’ve never seen. They saw God move in power in ways none of us could testify to. But that same generation didn’t pass that legacy down to their children. They didn’t instill in their children the message of hope, the message of salvation, through the stories of the miracles wrought by God. They didn’t teach how God had proven faithful over and over again. No, their parents were a complaining generation. This first generation complained to God throughout their wilderness journey and, when they died, they passed their complaining legacy down to their children. It’s no wonder that their children are at least as ungrateful as they were, taking God and God’s abundant provision for granted, just as their parents did. For this second generation had learned from the previous generation to complain about God rather than trust in God. When we sit around our dinner tables, when we have coffee at the Frozen Bean with a friend, when we grab breakfast at Huddle House with a coworker, when we’re in our walking groups or fellowshipping in our small groups, what is the general mode of conversation? When we’re here at church, when we’re with our children or our parents, when we’re in conversation at all, what’s the general gist of the conversation? Is it complaining? If we’re honest, the answer is too often yes. Which means that, all too often, we’re spreading venom. That’s the power of complaining. I must admit, it’s far deadlier and far more consequential than even I would have thought before living with this scripture in preparing for this sermon. It’s had quite an impact on me for, while I wouldn’t think of myself as a complainer, I complain like everyone else does. So, it left me with a question of what we’re to do when we feel like complaining? How do we avoid being like these Israelites, ungrateful, taking God for granted, complaining that God’s provision isn’t good enough? How do we stop being a person who spreads the venom of complaining, bringing death to our workplaces and homes? How do we cease our complaining? We look to the bronze snake. The prescription for the Israelites was to look at the bronze snake, an odd thing when we consider that the Israelites aren’t to have idols. But it becomes clearer when Jesus references this moment and this particular bronze snake. In the gospel of John, just before the famous verse John 3:16, Jesus tells Nicodemus, “just as Moses lifted up the serpent in the wilderness, so the Son of Man must be lifted up.” Jesus knew that the duty of life lived with God is to give God glory. The Son of Man was lifted up, put on the cross, so that God might be glorified by saving us. So it was with the snake, a visual representation of the seraphim, the heavenly host. The bronze snake caused the people to be reminded that they must rely upon God, trust God, remember that it’s God who saved them and continues to save them; in short, redirecting themselves toward God to give God the glory for what they had. And so it should be with us, redirecting ourselves toward God to give God the glory for God’s gift of our salvation. When we do so, we remind ourselves that everything we have, everything we know, everything we love, is a gift from God, a provision God has given us out of God’s abundant blessing. It’s God’s great joy to provide for us, for God loves us and wants to give us the best. But when we’re ungrateful, when we complain as the Israelites did, showing no thankfulness for the blessings God has given us in our lives, what we’re really saying is that we are deserving of glory because life should be all about us. Complaining, being ungrateful, is very self-centered. We take God, and God’s blessings in our lives, for granted when we complain. Which is why God reacts so violently and so strongly. God’s actions are warranted, but even though they are, God still chooses to save the people. For them, through a bronze snake on a pole. For us, through the ultimate pole: the cross. The Son of Man, Jesus Christ, was lifted up for our sakes that we might be saved. And so we are, and so have received the greatest, most abundant blessing imaginable: relationship with God. That should lead us to be grateful, no matter the circumstances, for no matter how difficult our lives, no matter the hate we experience, the financial downturns, the health scares, the job losses, the family ruptures; no matter how self-centered we are, no matter how much sin we see in our lives, no matter how much we have known ourselves to perpetuate evil in the world; no matter the injustices we have endured or the ways we’ve experienced evil prey upon us, no matter what, there’s always something to be thankful for because there’s always some way in which God is blessing us; always some way we see God saving us. That’s what this second generation in the wilderness misses: they miss seeing how God is blessing them because they’ve taken God for granted. They don’t know how to look for it because their parents hadn’t taught them how. Imagine if the first generation, the people who witnessed God’s salvation across the Red Sea, had practiced a habit of gratitude. The second generation would never have complained and we would have no story of fiery, flying, venomous, heavenly snakes. But that wasn’t the case; the first generation left the second with a legacy of complaining. And that legacy of complaining, unbroken from generation to generation, leads to increasing distrust in institutions and faithlessness among a people. Such was the case for this generation in scripture and such is the case today, as my generation reports the lowest numbers of trust in traditional societal structures and the least amount of adherence to faith ever recorded. So, the next time we’re tempted to complain about millennials, or generation Z, we must consider the legacy we give them through those complaints. We really have no one to blame for the faithlessness of a generation but ourselves, for our complaining legacy teaches distrust of God, spreading the venom of distrust by demonstrating that, while we claim the name of Christ, we’re really self-centered, seeking the glory for ourselves, taking God for granted. To inspire a legacy in future generations to trust in God rather than complain, to live a life of positivity rather than negativity; in other words, to kick the habit of complaining, we must make a new habit: a habit of gratitude, one that remembers the good things God has done in our lives. Doing so prevents us from taking God for granted, tuning our hearts to sing the praise of God and give God the glory. To create a habit of gratitude isn’t hard; it just takes work, for about a month, the amount of time it takes to create a new habit. When being negative, when tempted to complain, if we’ll simply start reminding ourselves of the great things God has done in our lives, we’ll discover God redeeming and restoring us. We’ll find ourselves less likely to complain and more likely to share with others, including generations under us, about the great things God has done in our lives. Such teaches faith, such teaches contentment, such teaches trust in God, and such is a powerful legacy for future generations. For we have many reasons in our personal lives to be grateful for all that God is doing for us and among us. In a bit, we’re going to share together in a list of just those things, reminding ourselves as a church of all the wonderful reasons we have to be grateful to God. We engage in that practice to see how simple it is to remind ourselves of God’s great blessings in our lives whenever we’re tempted to complain. It just takes practice to consider them, to remember them, to see them, and to allow that memory to be more powerful than the memories that lead to complaining. We have a choice before us this morning: will we be a complainer, an infectious person in our families and church and community; or will we live as an example of faith, practicing a habit of gratitude for all God has done? This Lenten season, we are starkly reminded of the primary reason we have to be grateful: God sent his only Son to be our savior, to die for us to defeat sin and death, destroying their power forever. That’s reason every day to sing from the rooftops, for by the simple act of saying to God, “yes, I believe in you and need relationship with you,” we are saved and experience the power of God’s unconditional love restoring us. That’s reason to celebrate! It’s reason to be grateful every day! It’s reason to teach the generations that follow us about the Jesus we know, about the power of salvation in our lives. It’s reason to never again complain. So what will you do? Will you complain, or will you practice a habit of gratitude? The next time you’re tempted to complain, the next time you desire to join in on a complaining conversation, remember instead all the great things God has done for you. Thank God for something great and good that he has provided in your life. Tell your children, your grandchildren, your nieces and nephews, your neighbor’s children and, indeed, anyone who will listen, of the wonderful, miraculous, things God has done for you. Doing so, you will inspire future generations to trust God. Be mindful this morning that to complain is to infect a community, a family, a generation, with a venom that leads to death. Choose life, instead, giving God the glory by practicing a habit of gratitude, living a life marked by the remarkable words of the Apostle Paul: rejoice always, pray without ceasing, in everything, give thanks.